CanwaxWest (CWW) is now accepting submissions for Waxing Poetic 2019. 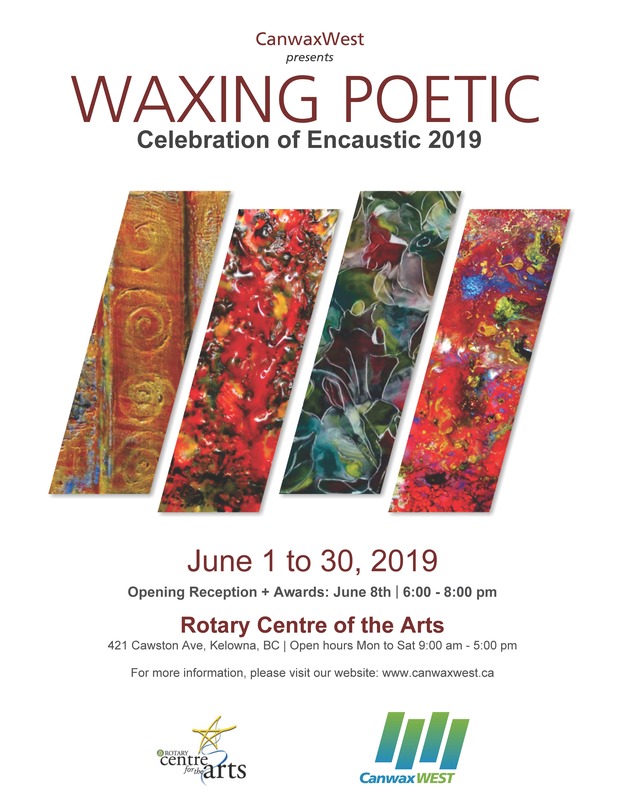 This celebration of encaustic painting will exhibit at the Rotary Centre of the Arts from June 1 to 30, 2019. Waxing Poetic is an open show and juried for prizes. CWW wants to encourage all artists working with encaustic, from every experience level, to submit their work to CWW shows. Opening reception and awards are on June 8th at the Rotary, 6:00 to 8:00 pm. All submissions are to be sent to Jan Kreut at cwwnews@hotmail.com by May 10, 2019. Please include “Attn: Waxing Poetic 2019” in the subject line of your email. Each artist can submit up to 2 works, size dependent. Note: limited space over 24 inches wide. We encourage you to go to CWW website to see photos of the appointed spaces art will be hung. Please connect with Jan at the email above if you have questions or concerns about the size of your work. Include the Waxing Poetic submission form and sales agreement, at the end of the document, along with your up to date artist biography and statement. * Previous submitting artists please provide a fresh copy your bio/artist statement – one page only and ready to put in the show artist binder. Deadline for Entry: May 10, 2019 at 4:00 p.m. Delivery of art must be to the Rotary Centre of the Arts at the appointed day/time shown above. If you are arranging your art to be taken by another person please arrange this prior to drop off day. Note: we will have a group of people travelling on the drop off day to hang the show. There will be limited space available for artists who cannot drop their work on in person. Please have your art labelled and $20 clipped to the info sheet. Judy will accept mail in paintings at her home but you must make sure your artwork arrives by May 17th. The show will be hung on June 1st. Completed sales agreement form must be included with artwork when shipping or in person on the drop off day. You are responsible for paying the return shipping of unsold art.